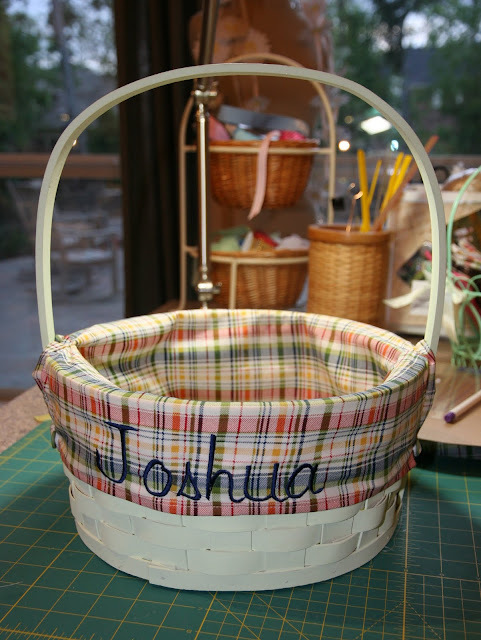 As promised..the Easter Basket Liner Tutorial. I really wanted to post this because if you are like me, there is probably a good possibility that the bin you store your Easter decorations in is still sitting out. Why not make them now and then you don't have to worry about it next year! If you don't have a basket/baskets...run to the store now. Usually they are upwards of 70% off at the local craft stores! The reason I decided to do a tutorial is that every liner tutorial I found was very loose and I like a tailored look. I found these baskets at JoAnn Fabrics on sale two weeks ago. They are really sturdy for my rough and tumble guys. First, I measured the bottom of the basket by drawing a circle on cardboard. I then trimmed it to make sure it fit on the inside. The template made it much easier to make 4 circles the same size. Measure the circumference and height of the basket sides. I added 2 inches for seam allowance and hem. A simple small hem (folded twice 1/4 inch) is sufficient. At this point is when you embroider the name. 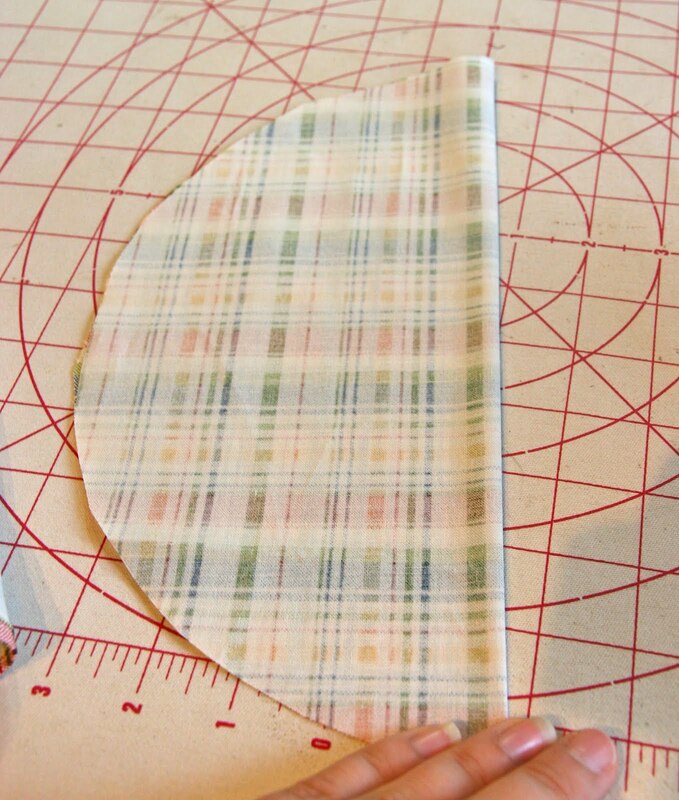 Fold and sew the short ends together (wrong sides facing each other). Start at the raw edge and stop at the height of the top of the basket. Be sure to backstitch to secure the seam. Fold the circle in half so the center is marked. This is where the basket handles are. Pin the strip with name onto the circle. Align the seam with the center that was marked on the bottom circle so that the slit that was left open matches the basket handle. 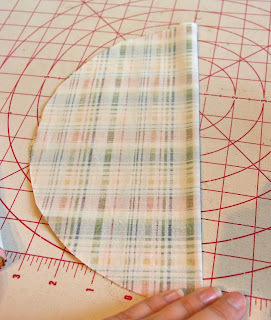 Then sew the edges with a 1/4-1/2 inch seam allowance. Using the centerpoint line that was folded into the circle, cut slit down from the hem on the opposite side for the other basket handle. I was in a rush for the boy's Easter egg hunt so I had stopped right at this point. I thought the fact that it was so snug to the basket, that it wouldn't get loose. So I came up with the following plan to fix the problem. I used a two inch bias tape maker. You don't necessarily need it, but I find them pretty handy. Otherwise, just fold and iron both side in. I didn't do a good job taking photos! I forgot to show exactly WHERE the bias tape goes! Hopefully you will understand when I say that the bias tape goes on the edge of the slits that were cut out. 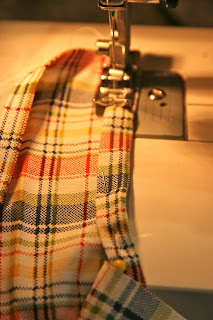 Start at one hem and work your way up the slit, then keep going down the other side of the slit. I added two looped elastic on the corners of the back two flaps. I made mine about 2.5 inches so that when it was looped, it was one inch after being sewn on. Now the flaps are secure and ready for RUNNING!! Here they all are in a row...terrible picture taken in the wee hours of the night. Which brings me to my next question? Why is the Easter bunny depicted as a boy? Last time I checked, he was sacked out in bed the night before! Hoping to get one of these done before our Easter Egg hunt tomorrow! Thank you for sharing! It's exactly what I'm looking for! Your baskets looks great! I have a question though - are the baskets tapered at all or are the straight up along the basket walls? Thanks!! Hi Laura...my baskets are more straight up and down. If there is any tapering at all, it is very slight. Personally, I would add more to the width of the inside rectangle to accommodate the largest circumference of the basket if I had a tapered one. Any extra fullness at the bottom would be minimal and covered by all your Easter grass and goodies! Hope that helps!